A bike sharrow is now placed in the middle and the original sharrow near the gutter is gone. Three months ago, we wrote about how Diana Sullivan was killed by a cement truck driver due to a poor bike lane design (or lack threreof) on King St. Any cyclist that was heading westbound on King St. would have soon found out that the bike lane they were riding fairly safely in would suddenly disappear right under their pedals when they reached midblock between 2nd and 3rd Sts. Not only did the bike lane disappear, but it was followed by a strangely placed single bike sharrow that told cyclists to ride closer to the curb. It was an odd set up because the sharrow was placed off to the side and not in the middle of the lane where it should’ve been and there were no other bike sharrows to follow. By riding close to the curb, drivers would try to squeeze by cyclists and perhaps clip them because the width of the car lane is not wide enough for cyclists and cars to share. It was also possible that drivers, especially large truck drivers (large blind spot to his right), would not see a cyclist and could run them over (as in the case of Diana on this very street and the recent death of Dylan Mitchell in the Mission District). Well, a couple of weeks ago I was riding home from a 6 hours ride in Marin County. I passed that one oddly placed sharrow and to my surprise, it seemed to have been moved to the center of the lane. I then saw another sharrow following and then another one… and they all were placed right in the center of the car lane! I was really exhausted that day from the long ride and from a bad crash I had on a train track, and I wasn’t so sure about what I saw. Was I imagining things? I had to go back the next day to check it out again. Low and behold, they were all there! Although I am grateful for the small improvement the City has made to this important corridor, it still needs a lot more work and I still have some major complaints about it. If the City has now put down more bike sharrows, why not extend them all the way to the Caltrain Station on 4th St. I don’t know what’s the point of having bike sharrows that end at 3rd St. Does the City really think cyclists are just going to disappear on 3rd St. after the bike sharrows are gone? Or maybe the City is expecting cyclists to risk their own lives after 3rd St. to the death monsters (aka cars). In actuality, bike sharrows are stupid and they are even more stupid on a fast and busy street such as King. There are still no speed limit signs posted, intersections are far from each other, and it leads directly to a freeway on-ramp: this encourages motorists to speed. As I mentioned in a previous post, the minimum design requirement for a street such as King are dedicated bike lanes. So, it looks like the SFMTA and DPW still have their work cut out for them in regards to King Street. They’ve checked off only two of the items on this list, below. Anyone think they will ever be able to do all that needs to be done? 3. 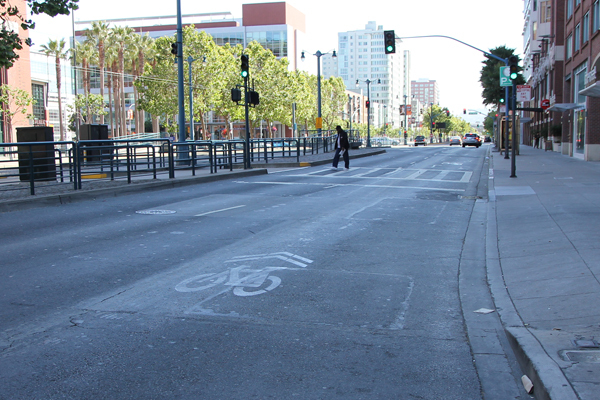 Need to paint bike sharrows all the way to the Caltrain Station not just stop at 3rd St.
Cars are not king on King St.